Are you looking to create a beautiful Malibu landscape in your home? If you need advice on creating a green and eco-friendly garden that will look appealing, as well, Busch Design Build, Inc. will provide you with Malibu native plant design ideas. In our other blog about green landscape design, we recommended picking plants that are native to your specific area. The main reason for doing so is to be green and plant plants that will thrive in our desert environment. California is a dry climate, and picking trees and plants that grow here will not only help them grow well, but will save you on water bills from not having to water them so often. 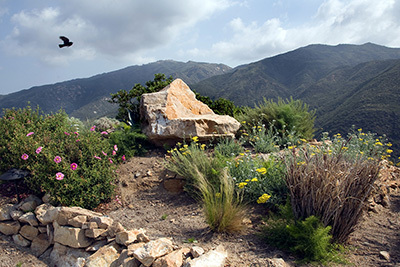 Here are seven ideas for your Malibu native plant design from Las Pilitas Nursery. 1. Mountain Dandelion – This plant, known by its Latin name, Agoseris grandiflora, is a great idea for your Malibu native plant design. These little perennials thrive in different habitats, and are very common in California. They have a thin green stem and start off with a yellow flower than turns into a white puff ball about two inches across. They can be grown in a perennial bed or even in a clay pot. 2. Big Leaf Maple – The maple tree, Acer macrophyllum, is so popular that many streets in the United States are named after it. Planting a tree in your front or backyard as part of your Malibu native plan design not only adds a look of greenery, but also has practical benefits. A deciduous tree, one that sheds its leaves, like the Maple tree, if placed properly, can provide shade to your house and lower air conditioning bills in the heat of the summer. The Big Leaf Maple is a good choice because it grows very fast, up to 10 feet a year, and becomes 30-50 feet tall with big green, orange, or yellow leaves. 3. Multiflowered Snapdragon – If you want to add some color in your Malibu native plant design, try Antirrhinum multiform. This little perennial delights the senses with two feet of white and pink flowers and an aromatic smell. As a bonus, this breed of Snapdragon attracts hummingbirds. This plant doesn’t need a lot of water once its established in its surroundings, and tolerates well in the Los Angeles heat. 4. California False Indigo Bush – Amorpha californica is a shrub native to Southern California. Although it doesn’t like full sun, you can plant it in an area with partial shade; it won’t need much water once it settles. This is a great alternative to a fence to keep your neighbors’ prying eyes out of your yard, as they grow to about six feet high. This shrub has purple flowers and a sweet scent; the best part is that it attracts the California State butterfly! 5. Purple Sand Verbena – Abronia umbellata is perfect if your house is on the beach in Malibu, as it grows in the sand and needs little water. This perennial has green leaves and purple flowers. It grows well in seaside conditions, and doesn’t need much attention while blooming throughout the year. 6. California Sagebrush – As the name indicates, this bush, also known by its Latin name, Artemisia californica, grows well in California. This shrub grows to three to four feet high, and is perfect for Malibu weather as it needs full sun, and almost no water to grow in coastal areas. It has leaves and little yellow flowers and a very pleasing smell. Busch Design Build, Inc. is a Malibu based global design firm that has been providing architectural and landscape design services for over twenty years. If you would like to learn more about our green landscape design services please contact us at your earliest convenience via phone or email. We also offer a wide range of other green services, including: Malibu Green Remodeling, Malibu Chemical Sensitivity Construction, Malibu EcoTech Build, Malibu pH build, and Malibu Eco Construction.